Bring cheeses and butter to room temperature. Add milk or wine, Worcestershire sauce, and pimiento and beat until well-blended. Cover and refrigerate for at least 2 hours. 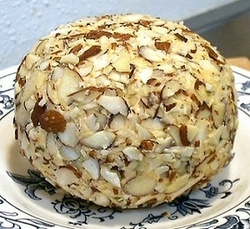 Mold into ball and roll in parley or nuts. Store, well-wrapped, in refrigerator for several days or in freezer for up to 6 months. Serve with assorted crackers.